Now that President Donald Trump and Congressional leaders Nancy Pelosi and Chuck Schumer seem locked in a stalemate, an assessment is appropriate. To start with, President Trump misspoke when he identified a "crisis" at the southern border. A crisis can be identified as "a time when a difficult or important decision must be made." The decision about placement of a border wall on the southern border need not be made immediately. It would take time to build. There needn't be a standoff of epic dimensions such as there is now. A little compromise by Trump and the two Democratic leaders can get the government back open and avoid further economic and governmental damage. Both leaders and the president are hard-headed and perhaps unable to satisfy their political bases by compromising. If they had America more in mind than their self-interests, compromise would be more likely. The word "compromise" is not an epithet. Recent Gallup polling shows that 54 percent of Americans favor compromise by government officials to get things done, while only 18 percent favor no compromise. As Trump's approval rating sinks to 37 percent, he should consider compromise as a political strategy, especially as the 2020 presidential election draws nearer. There's no question that fencing of some kind, or some other mechanism, keeps undocumented immigrants from unlawfully entering the United States. The Democratic leaders, and many of those who follow them, have already supported border security funding, so they should do so again by setting aside their contempt for the president. Wily as he can be, President Trump should "coax" them into supporting his plan for border security, with a promise of comprehensive immigration reform to follow. Immigration reform will be even harder. It will take effort by Trump, but it will be worth it — and it's something he could tout if he seeks re-election. But what exactly should he seek in such reforms? Recall that his campaign stressed the following: no amnesty, no chain migration, no illegal immigration, no visa lottery, a "pause" on green card issuance, and construction of a wall. 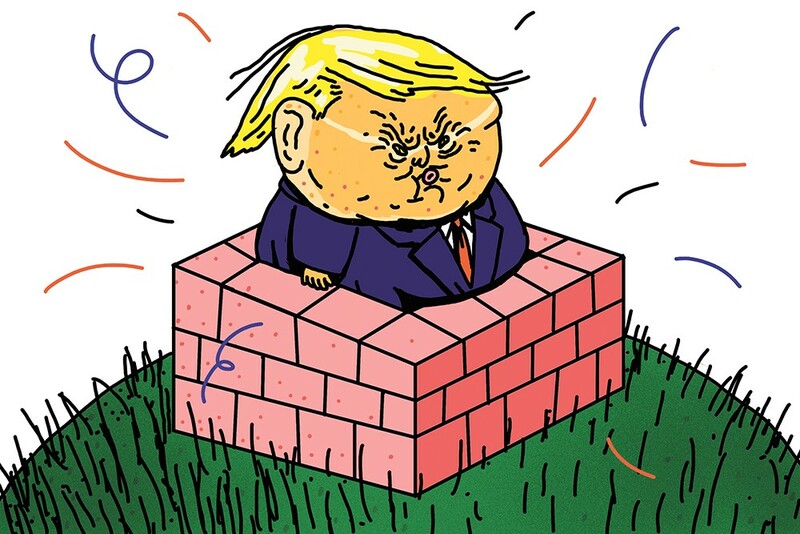 The wall can be finessed, and so can visa lottery, green card issuance and chain migration. President Trump should be satisfied if comprehensive immigration includes "no amnesty and no illegal immigration." Background checks on all citizenship applicants are required now, and DACA (Deferred Action for Childhood Arrivals) subjects (mostly students) should pass background checks and civics examinations at a minimum. President Trump was correct when he reversed President Obama's Executive Order on DACA and challenged Congress to correct the law involving DACA subjects. Congress has failed to act on either Obama's EO or Trump's. Comprehensive immigration legislation has eluded Congress for years — the last comprehensive immigration legislation was passed in 1986. Why? Because comprehensive immigration legislation has many parts, and members of Congress have deeply divided constituencies to satisfy. Members of Congress should not timidly try to please all constituencies. They should take a definitive stand, passing comprehensive immigration reform even if they have to answer for it to objecting constituencies. Federal employees are the true victims in this shutdown, so it's up to our leaders to sacrifice for the greater American good, explaining their position on immigration reform to those disaffected by their decisions. As a former U.S. senator once exclaimed, in a campaign slogan that got him re-elected for more than 20 years, "To Hell With Politics — Just Do What's Right." George Nethercutt represented the 5th District of Washington state as a Republican in Congress from 1995-2005. The original print version of this article was headlined "Compromise is the Hardest Word"